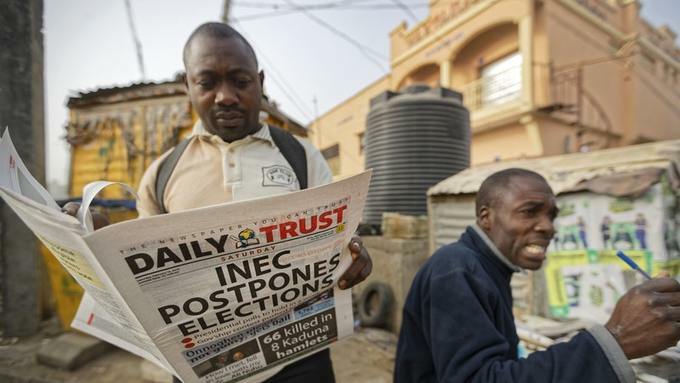 Nigeria’s electoral commission has delayed the country’s presidential election until February 23. Making the announcement just five hours before polls were set to open on Saturday, it cited unspecified “challenges” amid reports that voting materials had not been delivered to all parts of the country. The move was expected to cause outrage as many residents of Africa’s most populous nation and largest democracy had relocated for the chance to vote. “This was a difficult decision to take but necessary for successful delivery of the elections and the consolidation of our democracy,” commission chairman Mahmood Yakubu told reporters in the capital, Abuja. He said more details would be released during an afternoon briefing. Nigeria postponed the previous presidential election in 2015 because of insecurity in the north-east, which remains under threat from Islamic extremists. More than 84 million voters in the country with a population of some 190 million had been expected to head to the polls in what is seen as a close and heated race between 76-year-old President Muhammadu Buhari and top challenger Atiku Abubakar, a billionaire former vice president. “This is truly disappointing but … Nigeria will prevail,” the spokesman for Vice President Yemi Osinbajo said on Twitter, noting that Mr Buhari was already in his hometown where he had been set to vote. When Mr Buhari came to power in 2015 he made history with the first defeat of an incumbent president in an election hailed as one of the most transparent and untroubled ever in Nigeria, which has seen deadly post-vote violence in the past. Now he could become the second incumbent to be unseated. His term has been marked by a crash in global oil prices that spun Nigeria’s heavily crude-dependent economy into a rare recession, from which it only emerged in 2017. Unemployment shot up. The country passed India as the nation with the most people living in extreme poverty. More than 13 million children are said to be out of school. Insecurity on multiple fronts has seen little improvement, worrying neighbors of the West African regional powerhouse and beyond. While the military pushed Boko Haram extremists out of many communities in the country’s north-east, claims of the group being “crushed” have withered in the face of continuing violence. A new offshoot pledging allegiance to the Islamic State group has surged in recent months, attacking military bases – and this week, a governor’s convoy -sending tens of thousands more people fleeing. On top of that, banditry in the north-west, oil militants in the south and deadly fighting in the central region between farmers and herders over increasingly precious land keep security forces stretched and the population on edge. On Friday, authorities reported at least 66 deaths in a single community this week in what one resident blamed on farmer-herder clashes. “We love our country and we need our country to be safe from all the violence … and all the nonsense that takes place during election time,” worshipper Amin Muhammad Khalif said as he emerged from Friday prayers in Kano, Nigeria’s second-largest city in a nation largely evenly split between Muslims and Christians. Even in the fight against corruption, in which Mr Buhari could claim some progress, many in Nigeria have expressed concern that those targeted are mostly opposition figures. Meanwhile, many Nigerians worry about Mr Buhari himself after he spent more than 150 days outside the country for still-unspecified medical treatment. Spare in both charisma and physique, Mr Buhari spoke for just a few minutes at his final campaign rally on Thursday and struggled to hear or grasp a number of questions in a recent televised town hall. Borrowing from US President Donald Trump, top challenger Mr Abubakar has campaigned on the theme of “Let’s Make Nigeria Work Again”, while vowing to apply his business acumen to privatise Nigeria’s all-important state oil company and lift 50 million people out of poverty by 2025. Despite such proclamations, Mr Abubakar has never managed to shake years of corruption allegations. And, as Mr Buhari grumbled in his final pre-election address to the nation on Thursday, one “cannot simply proclaim jobs into existence”. In Abuja, 56-year-old Bako Sharibu was wrist-deep in a dumpster as he fished out pieces of plastic for recycling. His shy smile disappeared as he recalled that he once had good work as a caretaker. Now he struggles to make his target of 300 naira (65p) a day. Then he shook his pocket. It was near sunset. He had just 50 naira (11p). He will be voting for Mr Abubakar, he said. Nigeria needs change.